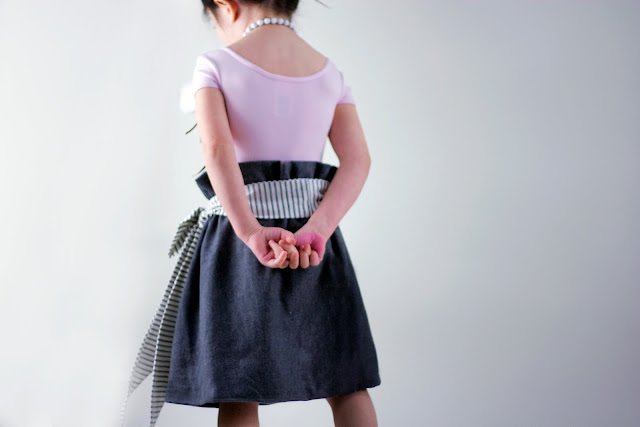 Grosgrain: 'It's My Party' Skirt GROSGRAIN GIVEAWAY!!!! CLOSED. 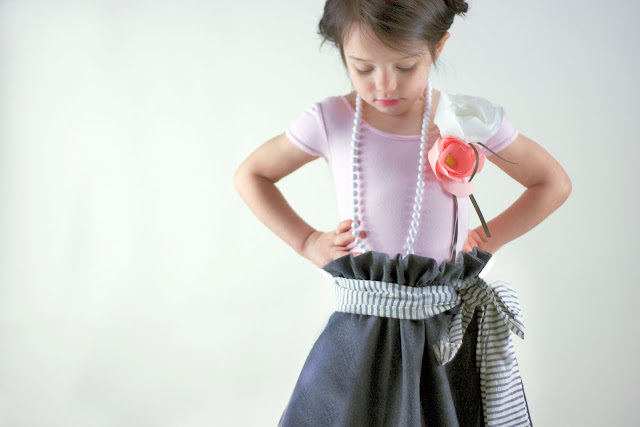 'It's My Party' Skirt GROSGRAIN GIVEAWAY!!!! CLOSED. I wanted to make a really girly skirt. Originally I intended this to be for an adult and wanted to sew in a white top. I still might try this out later. But sometimes I like to take ideas that I think might look good on an adult and model it on a child. There is a very limited selection of modern looking clothing for kids. I'm guessing its because there isn't as much demand. This is a dark grey wool skirt that is cinched at just below the top with cased elastic. I like the way the top of the skirt flares out. It resembles the look of the Lawn Frock, however, the Lawn frock had a cleaner pleated look. This is simply gathered which also has its own appeal. 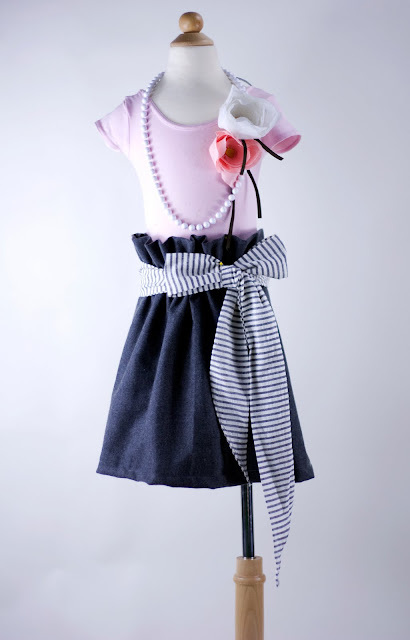 I added a blue denim striped seersucker belt and tied it in a bow to the side of the skirt. Since this is a wool skirt, it can be appropriate for winter. I liked the blue striped belt and pink top paired together with the gray wool. It has a very January look. All that's missing is a large round 3' pink balloon. Wow! I can't believe that I'm the first one this morning to leave a comment. maybe it will bring good luck. I love your creations so much & having two girls around the same ages is fantastic. I would love to see this on one of my girls. Very cute. I have two little girls that would be fabulous in this! I'm in love...and I linked! I've never entered a giveaway contest yet, but I LOVE all of your designs! Love this! I am curious how in the world you find the time...or for that matter all the material to be sewing so darned much??? That is amazing! I can't wait to see the grown-up version. Awesome...instead of entering I may try my hand at making one myself. Hope you don't mind! Your designs are so very inspiring! Soooo cute! I linked too! What a great skirt! I wish there was more modern, better designed clothing for children out there. I much prefer to dress my daughter in things I would like to where than in the "baby" clothes that's much more widely available. Oh, I'm linked too on fb. This is GORGEOUS! My daughter just LOVES getting all dressed up & she'd DIE to wear something adorable like this. My daughter would rock this! So pretty! My little girl would just LOVE this skirt!!! Here's my link to my blog! This is great, I like that it's modern girly, my oldest daughter is not girly at all but I think she'd like this because of the wool skirt...it's understated girly...so I can trick her! this is my second comment for linking and leaving a comment for doing so. I love this! We have 3 girls, so it would get a lot of "wearing" around here! What a sweet skirt. Just wanted to stop by and say Hello. This is so adorable, I have a new baby girl, but it's never too early to begin collecting sweet items for her upcoming wardrobe!! oh, that is so cute! I love it and so would my daughter. This is just delicious! I can imagine you setting a trend with this little beauty! Little girls everywhere will suddenly be wearing modern clothes, just like mommy (or big sister) lol. Lovele, as usual! My neice would look fab in this frock!! Pick me, pick me!! Linked it and love it! Love it!! Left a link. My little girl would love this skirt, as she has a thing for "fancy" clothes! I just linked to your oh so cute skirt giveaway! Count me in! Adorable. Love to have it for my soon-to-be little girl! well, Catherine's sweet girl really needs this beautiful piece of wool; and if I win it, I will give it to her! I wish people would put more of these on their kids than the awful garish Dora,Hanna montana and all trash like that ! My daughter would look adorable in this! I love this dress. You know, I linked to Facebook, but I'm not sure I did it right. I think it took the first comment and posted that on FB? I love this skirt, my daughter would look darling! Your are so talented! wow! So cute! I love all of your giveaways! linked to my blog too. What a fun fun outfit! I would love to see my litle girl in this. That is one beautiful waistline! I wish more of us women would dare to wear it too! It's actually a very waist-framing look. Would love to win that skirt! It's beautiful. Absolutely adorable! What a simple elegant but modern twist. This would look so sweet on my little girl. just found your blog.....sooo yummy. I soooo wish I could SEW. 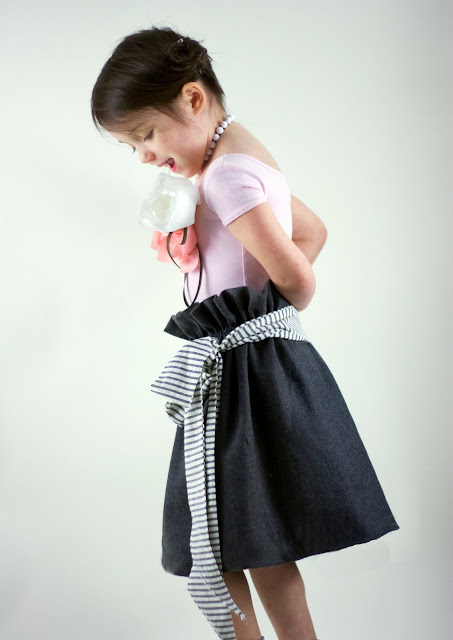 I linked...not only because my bridget would look divine in that skirt, but because your site is sew cute. I hope I'm not too late! I would love to see my little girl in this skirt! So sassy - I love it! Adorable. I linked as well. absolutely adorable - my daughter would love this! Wow! I love it! Maybe we should get together and start demanding more modern kids clothes because this is amazing! LOVE it so much! You are such a genius! Lovely Giveaway. I would love to win this.